Product prices and availability are accurate as of 2019-04-21 02:48:33 EDT and are subject to change. Any price and availability information displayed on http://www.amazon.com/ at the time of purchase will apply to the purchase of this product. College fans love to show their school spirit, and the Patina 31 in. College Fire Pit with Grill and FREE Cover is a great way to advertise your dedication while fueling up for the big game. You'll be inspired by the views of the blazing fire through the school name, logos, and mascot cutouts in the side of this classic fire pit. A must for tailgate parties and grilling before the game, this fire pit is made from durable cold-rolled steel with a natural rust patina finish that ages beautifully over time. The safety ring surrounding the pit can be used as footrest or as a handle to move this easily portable pit to and from the big game. The thick, sturdy legs are welded in place to prevent wobbling; no assembly is required. This fire pit includes a spark screen to contain errant sparks, a pit poker to keep the fire stoked, and a convenient BBQ grill for your hot dogs. Plus, you will receive a free pit cover to protect your new favorite tailgate accessory. A five year warranty protects against rust through or burn through. Inspired by the warm days and cool nights of the central coast of California, Patina Products offers fine outdoor accessories to turn your patio into a real living space. For over 10 years, the company has been warming up gardens and patios with unique, hand-crafted fire pits. They use specially designed CNC (computer numeric control) plasma cutters to cut virtually any logo or brand into the side of a custom fire pit. The gorgeous natural patina finish on each pit will age beautifully over time for an authentic, rustic look. 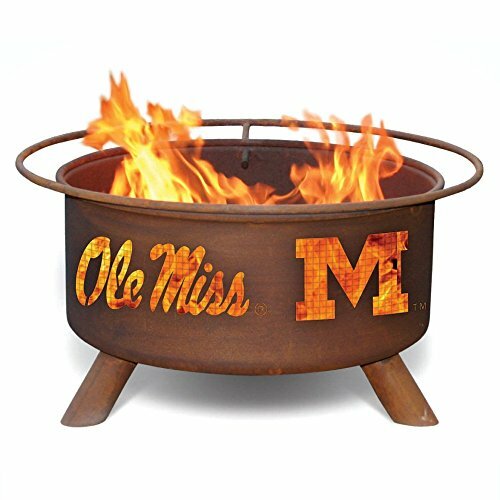 Let Patina Products create a fire pit that suits your unique style, and make the patio your favorite room of the house. Dimensions: 30 diam. x 16H inches. Free fire pit cover with purchase of fire pit!. College logos laser cut into side. Cold-rolled steel construction with patina finish. Portable design with sturdy welded legs. Includes poker, spark screen, and BBQ grill.